Where are you from? Your profession(s)? We met in the flat lands of north central Indiana in 1975. We paddled many of the rivers and inland lakes only to realize Indiana was too flat, hot, and uninspiring. So we headed to Michigan, first and foremost to be nearer to Lake Michigan (locally known as the “big lake”), more wilderness, and the forests. We arrived in Grand Rapids during the blizzard of ’79 and were elated to find real Michigan snow instead of Indiana’s slush. In 1979 Jim established his architectural practice and Connie was hired as a speech-language pathologist in the local public schools. Connie retired in 2015 and Jim maintains a small studio in our home. We continue to reside in Grand Rapids on the same city block as our two granddaughters. When and how did you become interested in paddling? Connie grew up in a canoe in Ontario and Manitoba where she spent her summers paddling the waters of Lake of the Woods, Manitou Island, and the inland waterway of Georgian Bay. Shortly after they married, she helped Jim unlearn his fear of the water and learn how to paddle a canoe. Several canoe trips in the Algonquin Provincial Park sealed their fate as life long paddlers. Where is your favorite place to paddle? 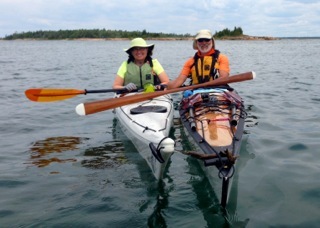 Our favorite place to paddle is the Georgian Bay in Ontario. We have paddled the 30 Thousand Islands chain several times and lead a group of friends out to the Bustard Islands in 2016. We have had access to an island cottage in the Georgian Bay watershed for over 30 years where we have shared our passion for the Great Lakes with our two children, granddaughters, and many friends. What is the most interesting thing that ever happened to you on a paddling trip? While our kids were still young, we set off on a week-long unsupported canoe trip on the Moon River in southern Ontario. As long time dog owners, we brought along our golden retriever and aging cocker spaniel. This was the first trip in which we were attempting to teach our children the joys of river camping. Along the way, our 12+-year-old cocker, Sarah, decided to unexpectedly up and die. This was extremely sad and rather perplexing, because…what do you do with the body of a 20-pound dog when you are camping on an island three days out? Put it in a bag and carry it out or bury it on site in very little soil? Does the “carry-out” rule apply to pet bodies? Anyway, after saying our good-byes to Sarah, we were determined to bury her in the meager two-inch Muskoka topsoil, with a rock cairn on top. But we were concerned that forest animals might disturb the grave site during the night. So, what do you do? Yes, we all took our prospective turns peeing on and around the grave, repeatedly crying and laughing during the ordeal. The next morning, the cairn and grave were intact. Yes, this is a one-of-a- kind memory, certainly an event that our children have never forgotten! Which Paddle Florida trips have you gone on? We have paddled on the Great Calusa Blueway and the Florida Keys Challenge. Both great adventures! Can you describe a Paddle Florida Trip Highlight? Paddling the open waters from island to island, observing and photographing the wild creatures above and below the water’s surface. The food is good but the entertainment was exceptional…especially musician Bing Futch! What advice do you have for folks considering a Paddle Florida trip? Just do it! For the adventure, education, and paddle enjoyment, you cannot buy a better, fully supported paddle experience in Florida. Great people, including organizers, guides, and fellow paddlers. Our plan is to do more paddling with Paddle Florida!